Safefume Fingerprint Chambers provide reliable protection for samples and work processes for a multitude of applications. LAFtech supply quality Fingerprint Chamber equipment and other related Forensic products Australia-wide. Safefume™ cyanoacrylate fuming chambers are designed to safely develop latent fingerprints using ethyl cyanoacrylate (CNA) vapour in a controlled environment for optimum effectiveness and safety where moisture and fuming time are critical factors. The tamper resistant compartment helps maintain the chain of custody. The unique Air Science Multiplex™ filtration system, together with professional design and unique construction features offer personnel protection during use. The ductless filtration system requires no connection to an outside exhaust system. The automatic control system programs the fuming cycle. A versatile system of hanging rods and shelves allows proper positioning of items of evidence in the chamber. The professionally designed automatic fuming chamber eliminates reliance on do-it-yourself systems that lack user-safety allowances and microprocessor controls needed for repeatable results. The Safefume system controls all functions from start-to-finish, permitting the investigator to initiate an unattended automatic cycle, establish the proper fuming intensity and duration, and to return upon completion to collect results. Fuming time, humidity and chamber fume evacuation can be user-set to comply with internal department criteria, lab safety protocols or best practices in evidence management. DUCTLESS TECHNOLOGY: The Eco-friendly Choice. Advanced carbon filtration technology offers a safe, high performance alternative to ducted cabinets for a broad range of law enforcement applications. Environmental Benefits. 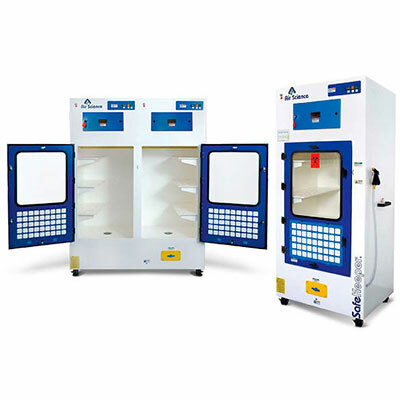 Air Science Safekeeper forensic evidence drying cabinets isolate and trap biological and chemical vapours to prevent operator exposure, prevent cross contamination, and eliminate ecological impact through release into the environment. Versatile. Each filtration system is designed for specific forensic applications using our exclusive Multiplex filtration technology. Easy to Install. Safekeeper drying cabinets are self contained; venting to the outside is optional. Down flow and standard units are portable and may be moved from one location to another without filter changes and with minimal downtime. Set-up, operation and filter maintenance are straightforward. Energy Efficient. Because filtered air is returned to the room, no demands are required of the facility HVAC capacity for make-up air. • Cost Effective. Facility ductwork, HVAC and construction costs are eliminated. Safe to Use. Cabinet airflow and face velocity protect users from incidental exposures to fumes, odours or blood borne pathogens. Self Testing. (select models) Electronic airflow monitoring ensures continuous safety. An electronic gas sensor monitors carbon filter performance. 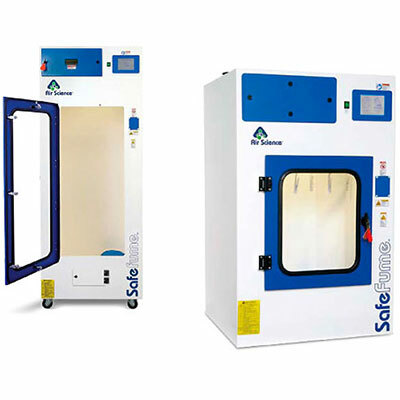 Air Science Safefume™ Automatic Cyanoacrylate Fuming Chambers, complement the range of controlled environment solutions available from our Australian laboratory and filtration products company. Filter I.D. Window: A strategically placed front cover window shows the installed filter part number and installation date for convenience and to encourage timely filter replacement. Filter Door Key: Filter access keys prevent unauthorised removal or accidental exposure to dirty filters. Track & Wheel System: An efficient filter clamping mechanism allows removal of main filter(s) directly to disposal bag with track and wheel system. Electrostatic Pre-Filter: The 99.5% effective electrostatic pre-filter protects and extends the life of the main filter and can be changed without tools while unit is running to prevent operator exposure to captured contaminants. Dynamic Filtration Chamber: The dynamic filter chamber prevents leakage of contaminated air by maintaining partial vacuum in the filter plenum. Control Panel: The microprocessor control panel manages the Printbuster™ Pro operating sequence with control, oversight and display of all processing functions. The LCD display works with a touchpad data entry keypad to establish all operating parameters. Doors: Tempered glass, keyed doors with aluminium frame and tamper proof seal, provide improved security, stability and ease of cleaning. (scratch-resistant glass for lasting optimum visibility). Shelving: Standard height units include one shelf in a fixed position. Extra tall units include one shelf that is repositionable to fit two configurations. Fan: High velocity spark less and brushless centrifugal fan. Colour: The cabinet is white with blue door(s). Hanging Rods: Removable and adjustable stainless steel hanging rod for proper orientation of evidence. Cool Mist Water Nebuliser/Humidifier: Programmable to achieve preset humidity conditions quickly and accurately, using a replaceable “wicking” filter to eliminate excess cyanoacrylate from building up on the unit. Hot Plate Accelerator: Hot plate to polymerise ethyl cyanoacrylate. 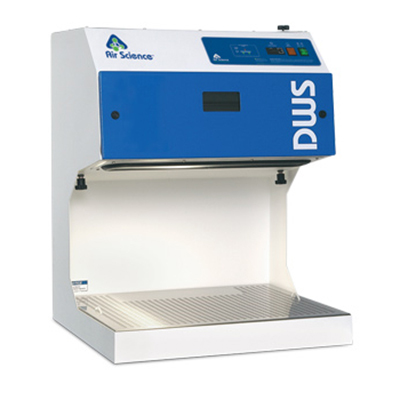 Air Science also offers optional adjustable temperature hot plates to accommodate a variety of fuming techniques, including Microburst and typical Super glue methods. Hot plates are available with basic knob controls as well as advanced microprocessor controls with LED display. 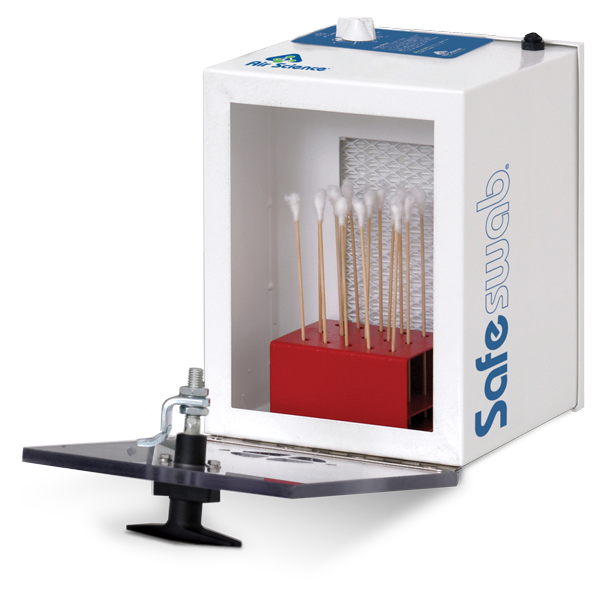 The Air Science automatic Safefume cyanoacrylate fuming chambers safely and automatically develop latent fingerprints on most non-porous surfaces using the proven technique of exposure to ethyl cyanoacrylate vapour. Evidence is positioned in the chamber with a flexible system of hanging rods and shelves. A fully automatic system controls and monitors the process. Choose from multiple sizes, from bench top to floor standing. Caster wheels standard on all models except bench top series. Optional side and rear windows for 360˚ view of development. DNA Decontamination UV Lamp System (optional) provides secondary disinfection of the interior between cases to prevent cross contamination, ensuring integrity of samples for DNA testing. Air Science Safefume™ chambers provide key operational advantages that make evidence processing safer, easier and more accurate. Internal Chamber Cleansing. Operators are protected from harmful cyanoacrylate vapour out-gassing when the unit is not in use. Even if the unit is not running, internal surfaces may still be contaminated from the previous processing cycle. Fuming Delay. Cyanoacrylate fuming achieves maximum results under 70% to 80% humidity. Air Science has developed a hot plate fuming delay that only activates at the user-determined chamber humidity, ensuring better results and clearer print impressions on the first fuming. Cool Mist Nebuliser. Open steam reservoir humidifiers are slow and inaccurate, while faster ultrasonic humidifiers remain sensitive to residue buildup on the water tank. The Air Science Cool Mist Nebuliser can be programmed to achieve preset humidity conditions quickly and accurately, using a replaceable “wicking” filter to eliminate excess cyanoacrylate from building up on the unit. Adjustable Temperature Hot Plate. (Optional) The Safefume™ is versatile, offering optional hot plates to cater to a variety of fuming techniques, including Microburst and typical Super glue methods. Safefume automatic cyanoacrylate fuming chamber includes features expressed through sound design and certified quality construction. Accessories add functional performance to meet specific applications. Professional Quality. Safefume automatic cyanoacrylate fuming chambers comply with current technical and safety regulations. Multiplex Filtration. The Air Science Multiplex Filter offers high performance and safety. Industrial Components. The cabinet frame and work surfaces are durable and chemically resistant. Reliability. Internal systems are isolated from fumes, extending product life. Air Science Safefumes use energy-efficient ebmpapst™ brand centrifugal blowers for long life and dependable performance. The Multiplex Filtration consists of a pre-filter and main filter to create a combination of chemical and physical architecture customised to each application. The mechanical design enhances safety, convenience and overall value. The electrostatic pre-filter is accessible from within the cabinet. A filter clamping mechanism allows for the filter to be easily installed and ensures an even seal at the filter peripheral face at all times to prevent bypass leakage. The filter chamber prevents contaminated air from contacting internal cabinet mechanisms. The main filter number and installation date are displayed in a front-access window. The Air Science carbon filtration technique is based on enhanced, activated carbon particle formulations from specially selected, naturally occurring raw material superior to wood or other organic sources. The carbon is treated to attain the proper porosity and aggregate surface area and to react with several ranges of aerosolised chemicals moved through the filter by an air handling blower. The carbon filter is a self-contained assembly sized to fit the specified product model number, and configured to optimise airflow across 100% of the filter surface area for maximum efficiency, prolonged filter life, optimal diffusion and saturation capacity, and user safety.